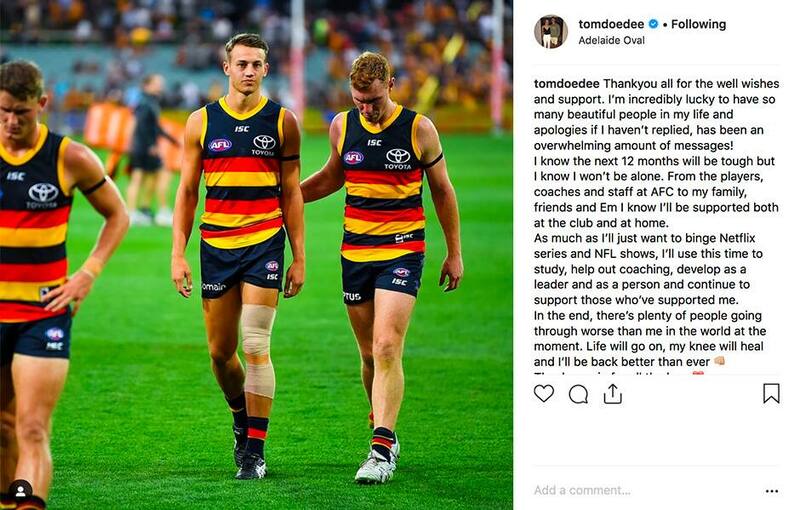 Adelaide defender Tom Doedee has taken to Twitter and Instagram to express his appreciation for the overwhelming support he has received over the past 24 hours. Doedee ruptured his anterior cruciate ligament (ACL) in the Crows’ Round One loss and will miss the remainder of the 2019 season. “Thank you all for the well wishes and support,” Doedee wrote. “I’m incredibly lucky to have so many beautiful people in my life and apologies if I haven’t replied, has been an overwhelming amount of messages! “I know the next 12 months will be tough, but I know I won’t be alone. “From the players, coaches and staff at AFC to my family, friends and Em, I know I’ll be supported both at the Club and at home. As much as I’ll just want to binge Netflix series and NFL shows, I’ll use this time to study, help out coaching, develop as a leader and as a person and continue to support those who’ve supported me. “In the end, there’s plenty of people going through worse than me in the world at the moment. “Life will go on, my knee will heal and I’ll be back better than ever.